Venus Diamond is a low stress, light-cured, radiopaque, nano-hybrid composite that is suitable for anterior and posterior applications. 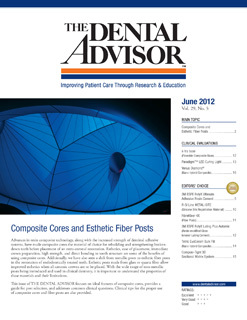 It is indicated for adhesively bonded, tooth colored restorations including: direct restoration of Class I-V cavities; direct composite veneers; shape corrections of teeth; splinting of teeth; indirect restorations; restoration of primary teeth; core buildup; and repairs of porcelain and composite restorations in combination with an adequate repair system. Venus Diamond is available in both 4 g syringes and 0.25 g unit dose (PLT) delivery in 23 shades. It should be light cured 20 – 40 seconds per 2 mm increment with a halogen or LED light. 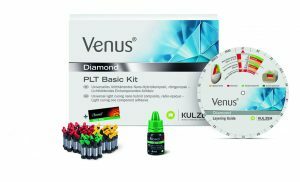 The Venus Diamond PLT Basic Kit contains 10 PLTs each of six shades; Supra Polisher; iBOND Total Etch, Venus Diamond Shade Guide; manufacturer’s instructions and illustrated guides. Venus Diamond was evaluated by 26 consultants in 641 uses. It received a 91% clinical rating. Consultants reported that Venus Diamond has nice esthetics with easy polishing. The shade guide is made of cured composite and accurately matches the restorative material. Since the composite changes shade after light curing, shade matching with the guide is recommended. Handling in posterior applications provides adequate packability. When sculpting the surface of the composite, the material is rather sticky to the instrument and drags, making contouring a challenge. The body shades provided in the basic kit were a little too opaque to be used alone for high esthetics. wenty-five percent of consultants reported that Venus Diamond was better than their current composite and 54% reported it was equivalent. Fifty-eight percent would switch to Venus Diamond and 81% would recommend it. Wet your instrument with bonding agent for easier contouring with less stickiness.